Today is day three in my reach to carve out five minutes every morning to start with writing. Lately I’ve been looking at my morning routine, and what I do to wake up and get active and realized that there is a serious problem with it. Get up. Go to the living room. Watch a little YouTube. Maybe turn on the computer for a bit and play a game, or check up on emails and contacts, then go to work. That is a completely passive morning where I am taking in information from various places, some entertainment, some news or social issues, but not putting out anything for myself. I realized that these morning pages are instead forcing me to start my day by focusing on something I love; writing. Now that’s a great thing. I can start every morning by putting in five minutes to write about what’s going on in my life, or the world, and instead of constantly consuming to start my day I am producing value for myself, and hopefully for those who read it. What else is happening? Prime day on Amazon was yesterday. That meant a bunch of stuff was on sale, and I didn’t buy any of it. BUT! I did participate, in a way. I put Witch’s Sacrifice, the first book in the witch’s trilogy, up on sale for 99 cents for the rest of the month. I’m actually doing a few pushes to get more people to see the Witch’s Trilogy because my hope is that when Dragon’s Flame finally comes out those readers will be interested in it, too. Five minutes are up. See you tomorrow. I am writing this on my phone, snuggled into my bed, just before going to sleep. I am a procrastinator. Hear me roar! The worst part about putting things off isn’t that they don’t get done right away, it’s that later comes and then you forget that you were supposed to do something. So here I am, typing my five minutes on a little keyboard with my thumbs because I said “I can do that later” and when latter got here and I forgot. But, I did manage to get some things done today. 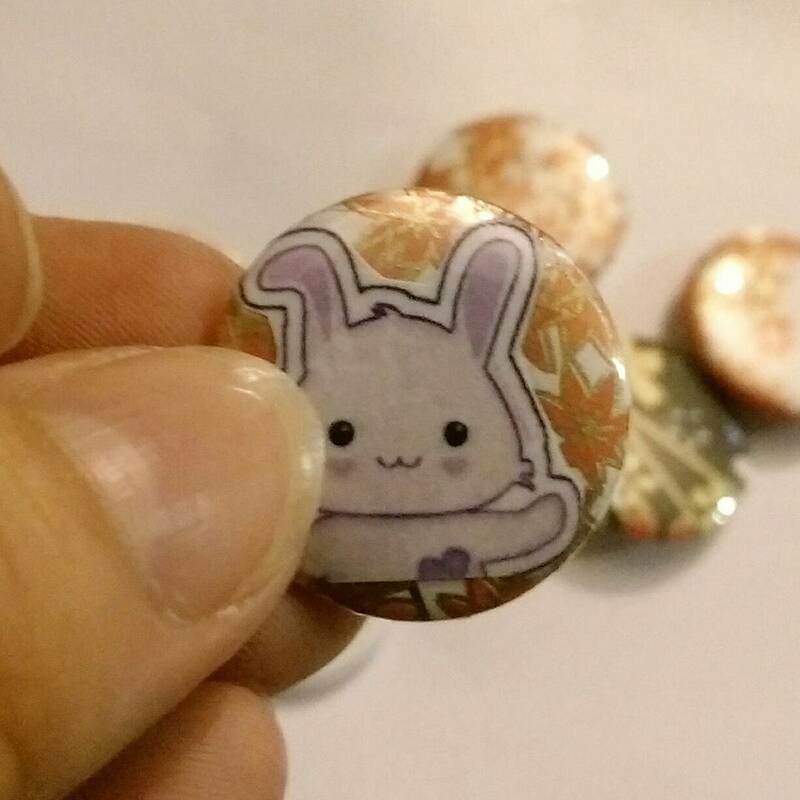 I just bought a button maker, and so I’ve been testing it out. Printing out little pictures and trying it out. So far I love how easy it is to make them. Simple rhythm of putting the pieces into the press, then pulling the lever in the right order. Easy enough, and I like them. I didn’t write today, except for this. I think there might be something to the morning pages. They prime the pumps and get you thinking about writing. But more on that later. Times up. ​Five minutes will change your life, right? At least that is what the writing “guru” Chris Fox said in his 5000 words per min book. Five minute sprints every day will help you become a better, faster, and stronger writer. So let’s put this to the challenge, why don’t we. For the next few months I’m going to try it. I will set aside five minutes every single morning and write about what’s going on in my writing, art, and general every day life. That means more blog posts here, and more time to get the thought’s out of my head. I have no idea what I’m going to write, so let’s be honest here. Sometimes the thoughts in my head get a little dark when I start listening to the news a little too much. Sometimes my depression gets the best out of me and I have a day where I’m in a funk, so we might have those day’s here too. But I’m still going to do it. Why? A long time ago I read a book called “The Writers Way” which had a very similar thing inside. Not sprints, so much, as a clearing of the house. A clearing of your mind by writing morning pages every day and clearing out the things inside your head so you could concentrate on the things that actually mattered. What’s stressing you? What’s consuming your thoughts? What are you constantly thinking about? Is your mortgage due? Is your child going through the terrible two’s? Is your husband being a little too demanding, or not attentive enough for your taste? Write about it. Put the stresses down and let the world have it’s say then you can set it all aside and just. go. Write. So that’s what I will be doing for the next few months. Five minutes, every morning.